"You can imagine how I feel - I won a big tournament last year and this is something very special for me. I want to thank all my friends that helped me a lot. I want to thank my wife that has done everything to keep me in a good shape for competing. I also want to thank my trainer. And most of all I want to thank Mexico for its hospitality, not in so many places you can find as many chess fans as here. I always feel great in Mexico. At this moment, I can recall Mr. Saggiante's words that this would be an unforgettable championship." On the other hand, the Hungarian Peter Leko congratulated Anand, the new champion for his triumph. "I congratulate him because he deserves it. The organization was excellent, and as far as I can tell, I will keep on fighting for the title." 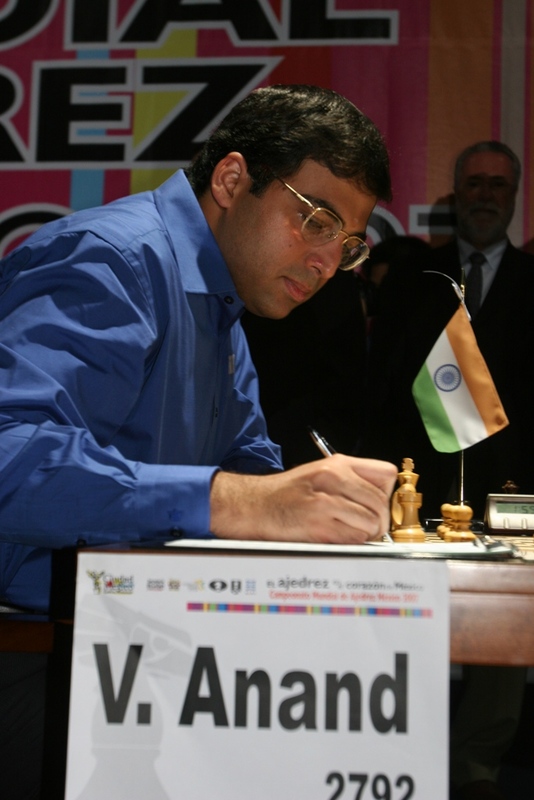 Vishwanathan Anand was born in Madras, India the 11th of December of 1969; he obtained the GM title at 16 years old. In 1987 he was the World Juvenile Champion in Philippines. In the year 200o he won for the first time the World Title, and according to the contract he signed with FIDE in the beginning of next year he will have to renew his title playing against the last champion Vladimir Kramnik. Peter Svidler 1, Alexander Grischuk 0, Alexander Morozevich ½, Boris Gelfand ½ , Vladimir Kramnik 1, Levon Aronian 0. 1. Vishwanathan Anand = 9 points. The former champion Susan Polgar mentioned about Vishy Anand : "He is a very good friend of mine long time ago. He has a very friendly image for Chess. He deserves to be the Champion because he played very well during the tournament; he was the best of all." On the other hand, the GM Miguel Illescas explained: "Anand was the leader of this Championship from the start. His game was very dynamic and aggressive. He performed the best way he could, he is worthy of the winning the Title". As for the organization, the Chairman of the Organizing Committee, Jorge Saggiante declared: "The sportive results were beyond our expectations. Most of the players demonstrated their amazing talent and their fighting spirit. Even on the last round, where the results were almost determined, we witnessed how the players fought until the last minute. I want to thank the Government of Mexico City, and the Mexico City Institute of Sport, because we could not make it without their help." It's important to mention that all the rounds were followed live by millions of chess fans through the Official Website of the Championship. Up to now the website received 1,139,596 visitors of 185 countries. Between the most important locations we find: Frankfurt, Mexico City, Madrid, Amsterdam, Budapest, Paris, Montevideo, London, Moscow and Milan. These visitors also had the chance to get exclusive casino offers at topratedonlinecasinos.org, which was an unofficial sponsor of the event. The closing ceremony of the World Chess Championship will be held tomorrow at 19hrs. at the "Palacio the Mineria" located in Tacuba #50 Centro Historico, Mexico City. "Today I was caressing the defeat but I got rid off it". That's how Anand resumed the rough battle he had to face with Alexander Grischuk, who was really very near to beat the ‘number one' in the 13th round. The Indian only has to draw as white vs. Leko to become World Champion. If he looses there might be a slight chance for Boris Gelfand, who will be Black to face Alexander Morozevich. It's for sure that Vladimir Kramnik will not hold on the title. The perspective of being "almost" the champion is not easy to manage: "The last days I slept much better than the days before. But in the game against Grischuk, I really had a bad time. There were some moments were I could have played better, and I think that Grischuk could have pressure more", Anand explained in the press conference showing up relax and content, just like someone who avoid an accident to happen. Although the leader of the Championship did not give for granted his victory, he knows that the possibilities are huge. This day looked like a possible disappointment: the first place was almost decided, and there were only three rounds to end; suddenly Vladimir Kramnik awoke, behaving like the champion he is to defend his crown. And Boris Gelfand also won, getting half a point closer to Anand, and giving excitement to the World Chess Championship. "Kramnik told me that he is going to do everything in his power to win the last three rounds" said the Spanish GM Miguel Illescas, who is friend and trainer of the current champion, explained in the Commentary Room. Meanwhile, the Russian demonstrated that his friend was right by giving some serious trouble to Leko with an interesting novelty on move 13, which threatened to leave the Hungarian breathless for a counterattack. But on the 19th Leko found the way out to release some pressure. However he committed a mistake on the 21st and from then on Kramnik was impeccable achieving a spectacular victory, and very instructive; that makes up for the disappointment on Tuesday vs. Grischuk. The eleven round of the World Chess Championship was a true demonstration of how chess should always be: a long, interesting and beautiful battle between two players motivated by different reasons, Viswanathan Anand and Alexander Morozevich. It also demonstrated what should never happen, two uninspired players with no courage at all to fight, Vladimir Kramnik and Alexander Grischuk, and the problem is that the first one still is the actual champion. Everything indicates that Anand will take his place on Saturday. During the press conference we heard Kramnik's saying: "If I didn't accept the draw offered by Grischuk [after only 13 moves! ], I would have offended him". That phrase outraged the veteran journalist Arturo Xicoténcatl, who replied to the champion: "Don't you think that you are the one offending the crowd of fans that follow you on the Internet?" The Russian explained once more the supposed balance of the position, but the truth is that he convinces no one. Only a severe sickness could justify such behaviour, but Kramnik has no signs for it throughout this Championship. The second leader (up to now) of the competition, Boris Gelfand, also quit easily after 22 moves in a position full of life against Peter Svidler. How many more examples will FIDE and the elite tournament organizers need to prohibit the draw offers? Fortunately for the dignity of chess, Anand and Morozevich played a good and interesting duel right from the start. The Indian knew that winning this game would leave him very near from the crown; therefore he worked consequently, squeezing the position to the maximum, moving his knight from an ineffective square into a magnificent one. On the other hand, Morozevich, always creative and fearless, tried by his counterplay to stop and difficulty Anand's attack as much as possible. Meanwhile Peter Leko and Levon Aronian got involved into a combat worthy of respect, but less attractive, that concluded as a draw. Anand's valiant knight arrived to his golden area, but Morozevich found a way to create serious doubts on his opponent, emphasized due to the perspective of having the title just around the block. "There were several moments where I didn't understand what was happening on the board", recognized Anand, who will be Black in the next two rounds, vs. Gelfand and Svidler. The ending could not be more exciting: Anand sacrificed his Queen, and offered his Rook in order to allow his valiant Knight to give the mortal step that assured the crowning of a pawn. Morozevich, who contributed to produce the beauty, had no more choice but to accept his defeat with all the dignity which Kramnik, Grischuk, Gelfand and Svidler didn't show on this Tuesday. Fortunately, humans forget more easily bad moments and hold on to good times. We shall never forget Anand's performance on the 11th round of the World Chess Championship in Mexico. Let us know how we can serve you. Please feel free to contact us using the form below. We really look forward to hearing from you! © chessmexico.com All rights reserved.